Each new player at Bingo Liner receives a Sign-up Bonus of £10 free (or $10), depending on the version of the software downloaded. Also awarded upon registration are 200 free slot spins, and there is no deposit required. Thereafter, a generous a 100% match bonus is offered for each of the first three deposits made. To qualify, the very first funds transfer must be between £10 and £50. Then, on the subsequent two deposits of £10 to £50, an additional 100% matching bonus is given. And on every new deposit of £10 or more after that, a 50% free cash bonus is offered up to a maximum of £50. 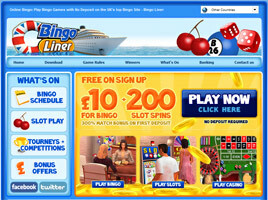 Launched in May 2005, Bingo Liner and Bingo Liner (UK) are both owned and operated by Blue Stone Interactive Entertainment Ltd. and utilise downloadable LeapFrog Gaming software. The former is licensed in Curacao, Netherlands Antilles, while the latter is licensed in Alderney. Both sites use English as their primary language. Bingo Liner mirror sites are also available in Denmark, Sweden, Spain, Norway, and France. All of the sites employ a nautical theme, with visuals suggestive of a cruise liner. On the dot-com site, which is targeted primarily to an Australian clientele and used as the base for sites in other languages, U.S. Dollars are used exclusively; play in British Pounds is available only on the U.K. site. A unique aspect of Bingo Liner is its “walk and chat” 3D software, which allows the player to customise an avatar that can stroll around the “cruise ship” and interact with other players. Both male and female avatars are offered, each with four colours of clothing. Setting up the avatar is possible only after the Bingo Client application has been installed on the player’s computer. Once registered, players have access to tourneys, competitions, and free play, as well as 75-ball sessions in the Starboard Lounge and 90-ball bingo in the Cruise Café. There is also a weekly marathon interlinked game called Mega Bingo at 10pm GMT, with cards priced at £1 each and payouts of over £412,000 to date. Standard games include Powerball, Even Stevens, Fast & Furious Speed Bingo, 5-Pence Events, “Strive for 25” with a guaranteed £25 prize pool, V.I.P. patterns, and £100 Pot of Gold games, among others. Schedules are clearly posted up to a week in advance. The Bingo Tab contains a full list of all 75-ball and 90-ball Bingo games. Side games are also big at Bingo Liner. They range from 3- and 5-reel classic slots to Blackjack, Roulette, Video Poker, and Keno. There are also numerous mini games, such as scratch cards and pull tabs, to entertain players between sessions. The Game menu is readily accessible from the Entrance Lobby and from the Game Menu option on the Menu bar. Among the progressive jackpot slots offered here are Pyramids of Cash worth over £325,000, Slots of Bingo, which as recently reached £197,000, and Blackbeard’s Booty topping £87,000. Of course, there are lots of fun chat games, too, and lively conversations with shipmates make the time aboard pass quickly. Another way to get a free bonus is by using Neteller to make deposits. The first purchase with Neteller receives a 100% match bonus up to £100. Other deposit options are available, too, although none with this two-for-one effect. Bingo Liner also has an exceptional “bash back” programme. Once the introductory offers have been received, all players get 20% back on future deposits. For the site’s VIP players, that amount is boosted to 40% back on all deposits. And for deposits made on Saturdays, the cash back offer is a whopping 50%. One other ongoing promotion is the Refer-a-Friend campaign. Players who get their friends to join up at Bingo Liner receive £10 absolutely free when the friend signs up and makes a first deposit.